The first thing you will notice when opening the box is how tiny the T30 is overall. I expected something about the same size as a typical tower PC from a few years ago, but this is significantly smaller than that. One processor, either a Pentium, I3, or Xeon E3-1225 v5. At most you’ll see 4 cores. A 7,200 RPM 1TB Toshiba drive. The case supports a maximum of four SATA drives total; three if you have the DVD drive installed. Lots of USB ports, 2 display ports, and an HDMI port. A single gigabit NIC installed on the motherboard. I am evaluating the T30 for my needs, which probably aren’t your needs. 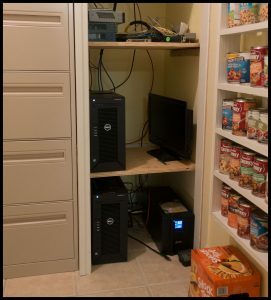 My goal is to run virtual machines here in my home, using the fiber internet connection at my house, and to do so while using as little power as possible. It turns out the T30 is a pretty good little box in this role. The primary advantage this server offers over more powerful and redundant alternatives is really frugal power usage. Two of the three servers I’ll be running are shown in this photo, and the total draw for everything (firewall, Ethernet switches, two servers, WiFi access point powered by PoE) is ninety watts. The servers are at idle, but the UPS in the photo thinks it can run everything shown here for 120 minutes, which gives me plenty of time to pull out the generator and power it up if power fails. If my UPS runs these servers for half that amount of time I’ll be thrilled. Another way to phrase this: electricity where I live is pretty inexpensive, but my Kill A Watt meter tells me the Dell T30 will only cost me $24 per year in power annually. That’s impressive, even when the numbers represent the machine running at idle. Let’s be clear: this is a single processor box, offering a Xeon with 4 cores that run at 3.3 GHz. That’s not slow, but it’s not a premium processor either. This is low end for a server. But really, what do you expect for less than $400? If you are curious about the CPU’s performance all I can tell you is that I measured 26,496 BogoMips. That’s not a useful number for most folks, but there are sites you can visit that will show you how well this CPU performs versus other processors on the market. 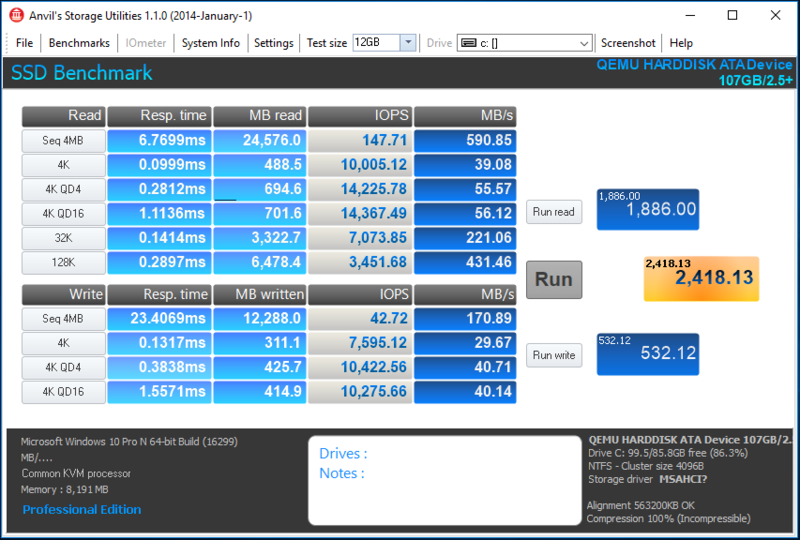 IOPS when writing are not great, but since the servers I’m running are database-backed and read much more than they write I expect things to perform quite well indeed, even with the low-end setup I’m using. “Low-end” in this case means HGST or Toshiba drives in a ZFS mirror, using a Samsung SM863 SSD as a separate log device. The good news is that the SATA ports on the motherboard seem to run at full speed, so there’s no need for a separate drive controller. The Dell T30’s SATA controller does support configuring your drives as a RAID volume, but I wouldn’t recommend it. I really like the advantages ZFS brings to the table, and if I weren’t going to go to the effort to deal with ZFS I would opt for a hardware-based RAID controller. Ideally one with a sizable NVRAM cache so I would get fast writes, at least up to the size of the cache. Past experience has soured me on integrated RAID solutions like this one — they may handle drive failures well, but controller failures are another issue entirely. You should be making regular backups anyway, but if you are going to use the RAID controller built into the motherboard you should be very diligent with your backups. Redundancy: there really isn’t any. Better server hardware will come with better redundancy. In particular I’m looking at hot-swap bays for hard drives, and redundant hot-swap power supplies. That power supply: the T30’s power supply is essentially a 290W desktop power supply with proprietary connectors. You can buy adapters on Amazon and EBay that are supposed to make a standard power supply work with the motherboard, but you should be aware you’re buying something non-standard from the start. Drive Capacity: 4 SATA drives (if you disconnect/remove the DVD drive) isn’t a lot. For lots of use cases it simply isn’t enough. Expansion: the T30 has enough slots to support the worst case I was considering: a gigabit Ethernet card, SATA controller card, and a dual-port 10GbE card. But only if I chose expansion cards carefully. You have one PCI slot, two half-length x4 PCIe slots, and one half-length x8 PCIe slot. Use them wisely. 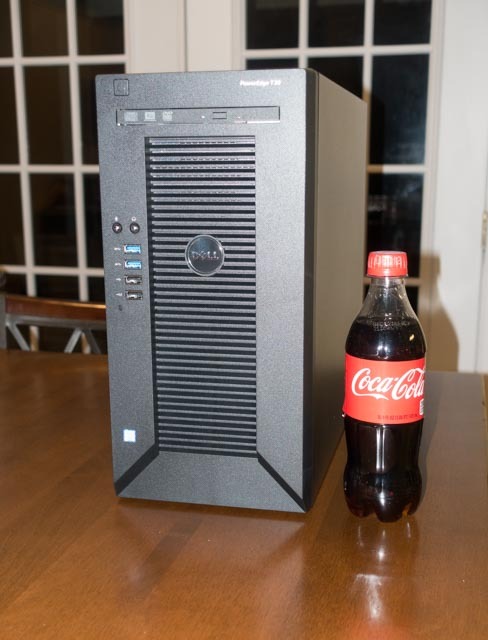 This is an inexpensive server with more than enough performance for my needs, which is the only real evaluation I can give. If you don’t need more than 4 cores on your processor, can live within the constraints of 64 gigs of RAM, don’t need more than a few drives, and can handle downtime caused by hardware failure then the T30 will probably work for you as well. I mean, aren’t most of us virtualizing our workloads anyway, using platforms that support high availability so a server failure really only means 2-3 minutes of downtime? This entry was posted in Review, Server, ZFS by Derek Zeanah. Bookmark the permalink.